Scooter driving classes like STAR or RETS can give you confidence and skill in driving your scooter safely for years to come. By the way, STAR stands for Skills Training Advantage for Riders and RETS (from the Motorcycle Safety Foundation, or MSF for short), stands for Rider Education and Training System. If you can manage it, I think it's a great idea to take a STAR or RETS scooter driving class, especially if you don't have a mentor to help you learn how to drive your scooter safely and skillfully. I wanted to take a class when I got my scooter. Unfortunately, the classes around here were all full, and since it was fall when I bought it, there weren't that many classes left either. And in Boise, first priority was given to people under 21 too, because Idaho scooter laws (and motorcycle laws) say people under 21 have to have the STAR course to even get their license. So it didn't work out for me. The Wheels in Motion website has a comprehensive list of training sites throughout the US that you'll probably find helpful in looking for a class in your area. 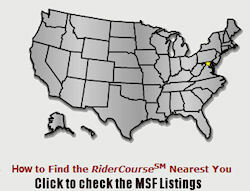 The Motorcycle Safety Foundation also has a great website, with links to courses in all the US states. The video below gives a great overview of what scooter classes and motorcycle safety classes entail. I highly recommend you take a couple of minutes to watch it... definitely worthwhile! One great thing about taking the RETS or STAR course (and graduating successfully) is that, in many states, it enables you to get your license without having to take a separate skills test. By the way, these courses were actually designed originally for motorcycle driving training, but since driving a scooter is a similar skill, you can also enroll in these classes in most cases. However, MSF does offer a 4-hour "Scooter School," which are scooter driving classes that specifically teach scooter driving tips and skills. Right now, it looks as though the course is only being offered in a few states, but that will probably change, since scooters are becoming so popular. The Scooter School likely won't allow you to bypass skills testing like their more comprehensive RETS course, but it may help you master the essential skills you need to pass a regular skills test and demonstrate that you really do know how to ride a scooter! So, if you want that extra help in mastering the art of riding a scooter, you really can't go wrong by enrolling in scooter driving classes like STAR or RETS.